In the UK and in many other countries around the world, proud owners of Land Rovers compete regularly in vehicle trials. The trials are designed to be a test of both the drivers and the vehicles ability to conquer off road driving conditions, and are held regularly throughout the year at many different venues. There are various grades of trials – some are designed for vehicles straight out of the showroom (TYRO) some are for the more adventurous but still using everyday road taxed vehicles (RTV) and several specialist trials are designed for vehicles of various modifications (CCV, COMP SAFARI & WINCH etc). 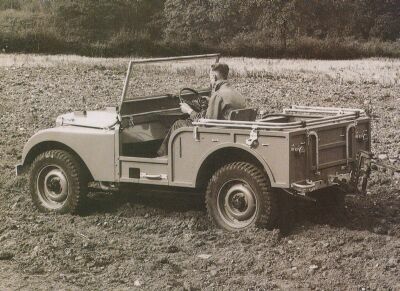 The prototype Land Rover (built in 1947) was designed as an off-road/on-road utility vehicle, part tractor, part road vehicle to be aimed at farmers. Ever since then, owners have ventured away from the tarmac and tested their vehicles in quarries, woodlands, mountains, rivers and the like. So what is involved in using a Land Rover “properly” with Red Rose Land Rover Club, who can compete, what equipment is needed and how much does it cost. Interested? Then read on…..
Red Rose Land Rover Club was formed in 1982 as a means of group therapy for a number of people suffering from the unfortunate, but increasingly common, disease of Landroveritus, a condition which has no known cure but which can be brought under some control by the purchase and use of certain vehicular products from a factory in Solihull. This initial “cure”, however is followed by serious wealth reduction due to the large number of cravings for ‘extras’ which these products require and the considerable drinking problem (petrol or diesel) which comes as an integral part of the use of these products. Monthly Club meetings were arranged so that like minded people could meet together and share the highs and lows of Land Rover Ownership. We are pleased to say that these monthly get-togethers still continue on the first Tuesday evening of every month where all are welcome, whether you are just considering the first steps of ownership, are already addicted, or have a serious case of Landroveritus. It’s sad to say, but we have some members who are considered beyond help (but we never give up on them) so they are simply encouraged by words such as “yes, of course you should buy it”, or ‘”it looks like a bargain to me, of course you should…”. Seriously, though, Red Rose Land Rover Club is a member of the Association of Land Rover Clubs (ALRC), a national organisation promoting all things Land Rover and all of our off road trials events are fully insured and held under their strict rules and regulations. This association also allows us to hold permits for caravan rallies on non registered sites. The Red Rose Land Rover Club is a democratic organisation and is run by a committee, elected each year from amongst its members, who are responsible for organising all the events, looking after the club finances, club equipment and 101 other things you never even realised needed doing. Any club member can apply for a committee place, with annual elections taking place at the AGM during the October club meeting. If you need to contact a member of the committee, their names can be found on the relevant web page so pin them in a corner at club night – they will be delighted to hear from you.